With Snowzilla leaving tons of snow in its wake we decided the recipe for a good bowl of Texas Chili would help to keep you warm. This is Texas Chili done right, with beer and no beans. The key is the different cuts of meat used (for texture) and of course, the beer. 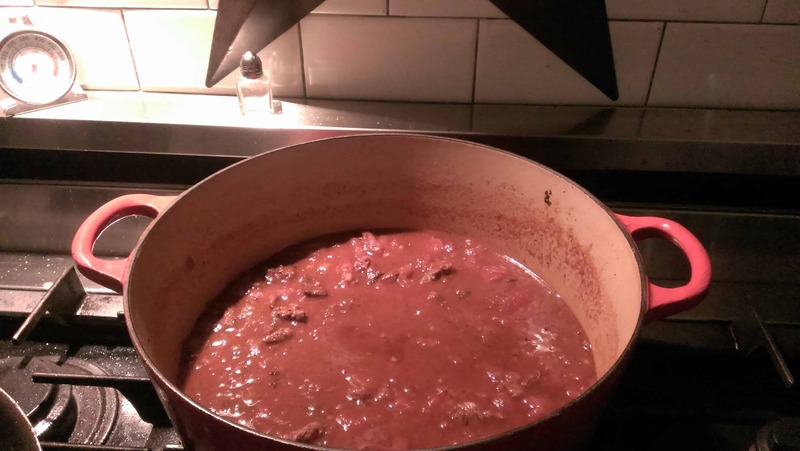 To make a great bowl of Texas Chili you want to slow cook it over several hours. A heavy pot with a tight fitting lid is a good beginning. Start by sauteing the chopped onions with a little oil over medium high heat for five minutes, stir occasionally. Add the minced garlic and let it saute for 3-4 minutes with the onions. At the same time, start your heavy pot over medium heat and add the stewed tomatoes, broth, beer, and spices (hold off on the cayenne pepper until near the end). Let it get up to a boil and then simmer. 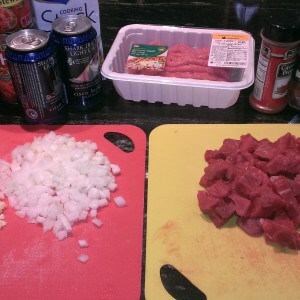 You will add in the sauteed onions, garlic, and seared beef soon. You now have the beginnings of a great pot of Texas Chili going, time to add the meat! Salt and pepper the stew meat to taste and then add a little oil to your skillet over medium high heat. You want to sear the meat well on each side, drain with a slotted spoon, and add to the chili. Next is the coarse ground chili beef. No need for oil, we want to brown the chili beef, drain, and add to the chili as well. That’s it. Let it slow cook over low heat for 3-4 hours and enjoy! Add the cayenne pepper a little at a time in the last half hour or so, it gets hot quick. We top ours with shredded sharp cheddar, a scoop of sour cream, and a squeeze of lime. For a great alternate recipe, try Double Chocolate Stout beer and shave 4-5 small bars of Hershey’s chocolate into the chili and let it cook. This is different from what you would expect, it does not necessarily make it sweeter or taste like chocolate…it just gives it a great depth of flavor and something you have probably never experienced before. If you have any secrets to your chili recipe, we would love to hear them. For more great recipes and things to do while on Cape Cod, subscribe to our blog at the top of the page and keep up to date. If you love food like we do, consider our new Taste of Cape Cod – Culinary tours package when booking your reservation. It is sure to expose you to new treats and experiences you may not have considered possible on Cape Cod.